With over 27 years of experience in the Travel and Tourism Industry, moving from New Zealand to Australia in 2004, Karen’s experience and passion comes across to all those she meets. Karen started with Cruise Traveller in 2004. As one of our Key Partnership Manager’s Karen takes good care of our trade friends in Queensland, Northern Territory and Western Australia. 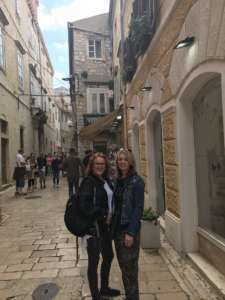 Karen in Zadar, Croatia with Roh. Antarctica, The Canadian Arctic, Greenland, South America, The Kimberley, USA, Canada, The United Kingdom, Singapore, Malaysia, Japan, Hong Kong, Macau, Indonesia, New Zealand, New Caledonia, Vanuatu, Fiji, Thailand, Alaska, France & Croatia. MV Voyager, P&O Cruises, Silver Shadow, The World, Orion, Minerva (Swan Hellenic), Sea Adventurer (formerly Clipper Adventurer), Ponant aboard L’Austral, Safari Endeavour with UnCruise Adventures, Riviera Travel River Cruises – MS Lord Byron & Peregrine Adventure Cruising – Peregrine Dalmatia. Antarctica: Without a doubt, the MOST amazing experience, sitting around in the zodiac when the engine has been cut, with penguins and leopard seals swimming around you. Being amongst the most gorgeous icebergs, all different colours was just simply spectacular. Arctic: Meeting the Inuit people of Greenland, being welcomed was into their villages was a very special time. Plus mention has to go to the beautiful Polar Bears – breathtaking! Our Cruise Specialists are here to help. Need a brochure? Request today.